Pea crabs are small crustaceans from the Pinnotheridae family. Females can reach 12mm in size while males can only grow to 7mm. The Pea Crab is a parasitic creature, living inside of marine bivalves. While mollusks are the prefered hosts, other possible hosts include sea cucumbers, sea urchins, parchment worms, or mud shrimps. The host is used for safety, food, and oxygen. 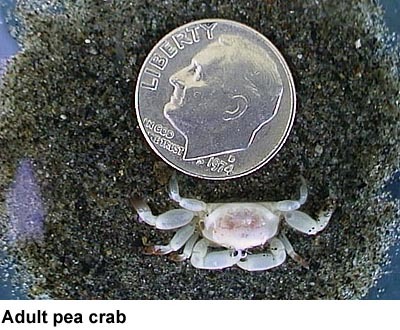 The relationship between a pea crab and its host is parasitic rather than mutualistic because the pea crab can damage the host during its inhabitance. If the host is a mollusk, the crab lives inside the mantle cavity, which functions as a respiratory chamber for the host. A study by Rosina M. Bierbaum and Scott Ferson in 1985, concluded that blue mussels (Mytilus edulis), pea crab inhabitance causes shell distortion and reduced growth rates. In addition to residing in its respiratory chamber, the crab harms the host by feeding off of the plankton brought in through the gills, essentially stealing its food. This page was last modified on 18 February 2011, at 14:49.